Every dollar we raise goes to supporting our pro-shooting lobbying and election campaigns, which aim to make sure elected politicians look after what you love to do. Your donation will help us support those who support shooting and end the careers of others who don’t. There are two different ways you can donate! 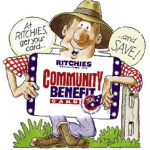 Just go to the service counter at your local Ritchies IGA ask for a Community Benefits card and quote this number to nominate the CFCV as your community organisation – 91698. Then go shopping and everytime you show your card at the checkout, Ritchies will donate part of what you spend to the CFCV! This only applies to Ritchies IGAs – not other IGAs! Click here to see where your nearest one is.